80-degree weather in mid October! 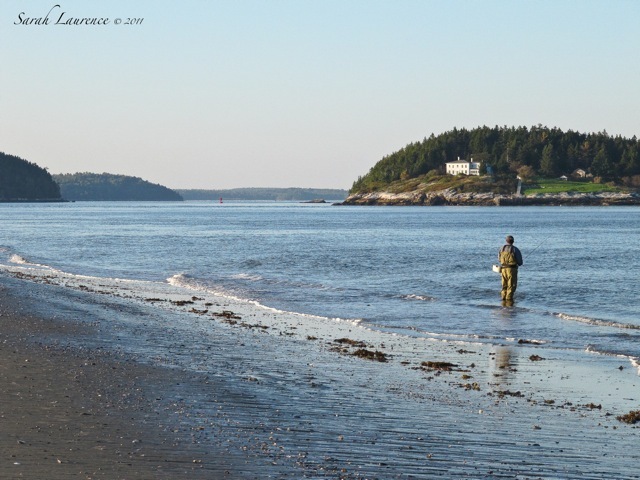 A fisherman looked overdressed in his waders. 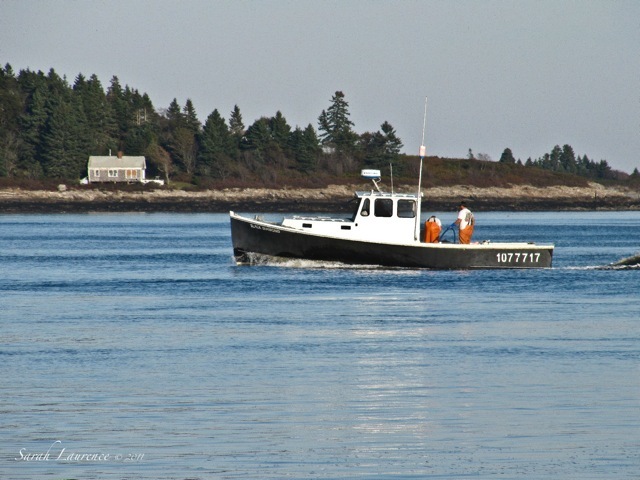 Lobstermen in t-shirts were hauling in their catch. but Spinney’s was still serving lobster rolls and Moose Tracks ice cream. Swimming in a bikini, I surprised a kayaker in a wet suit. The water wasn’t any colder than in June...really. Scout, unconvinced, left the waves to the seals. 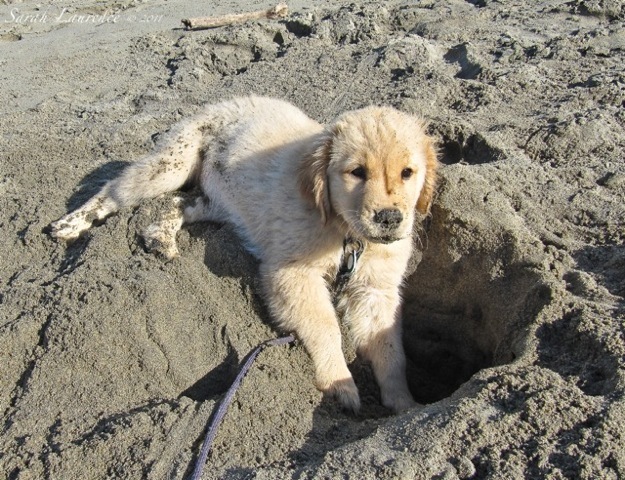 She dug a cool hole in the sand. wishing these warm days would never end. So very wonderful. Scout is adorable! Marvellous photos. It's quite pleasant over here, too. 19-20 degrees (Celsius). Incredible shots- love the part about you surprising the kayaker haha Not so sure about the water, probably too cold for me... That wade fishing photo is beautiful. I have not done that myself in a while but I love it. Very peaceful. First frost! I can not imagine though it has cooled down here somewhat. And Scout! Doesn't get much cuter that that. What a wonderful way to spend a day. Scout is SO cute!! It's hard to imagine you flashing a kayaker in your bikini! Kayakers just never know what treats are in store. We, too had a perfect long weekend (Canadian Thanksgiving) and spent it at a wedding on the St Lawrence River. No bikinis or Moose Tracks but the bride requested a chip truck serving Poutine during the late night festivities. 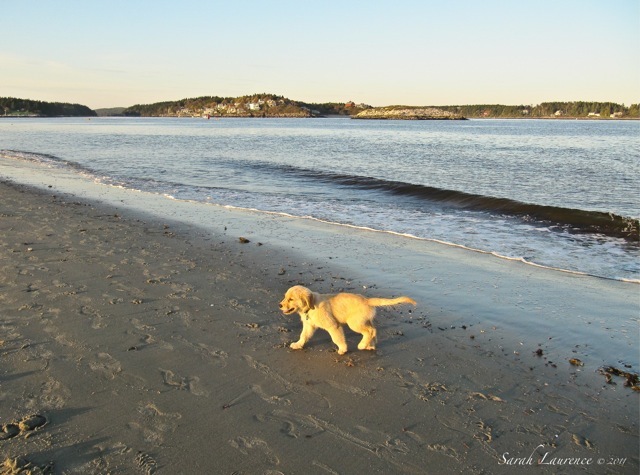 A puppy on the beach. Now that's a happy sight. 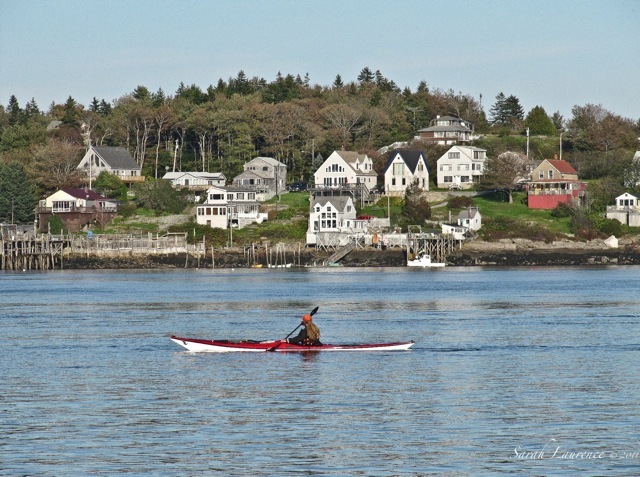 I'll be in Maine next week.... praying that weather holds! I always love your photographs, but it's almost like you can feel the rare warm glow of Indian summer coming off of these. Such blissful photos. Yes, the weather has been a delight. Scout seems to think so too. Buster is wildly jealous. We've been having beautiful mild Indian Summer weather here in Iowa too, when just a few weeks ago there was frost and we had to wear coats. I love this mild weather in fall, especially with the foliage as a backdrop! Oh, btw, we say the same thing in Texas about the weather. Unfortunately, it hasn't been so true for us this summer! *sigh* That was like reading an art journal. I felt I was there amidst the warmth and beauty. In fact, now I want to visit that park! Those photos have such a nostalgic feel to them. Almost like black and whites with color tint. So beautiful. I'm !uite smitten with Scout. Our near frost and weekend in the 80's was amazing too. Why is it so hard to let go of summer? Freedom I suppose. Enjoy. 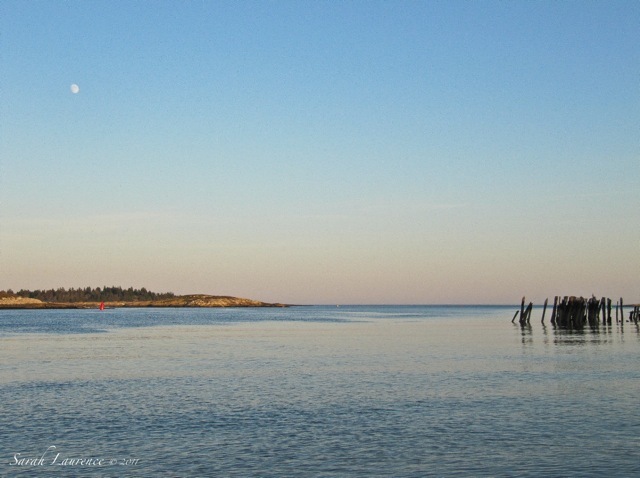 Thanks for sharing your day, but having once tried to swim at a Maine beach many Julys ago, I will leave that to you. I could not make it past my ankles and had to turn back. I thought that saying about changeable weather was only for Illinois:) Glad to see you are enjoying this beautiful fall weather. Lovely images, but my favorites, naturally, are of Scout--what a cutie! 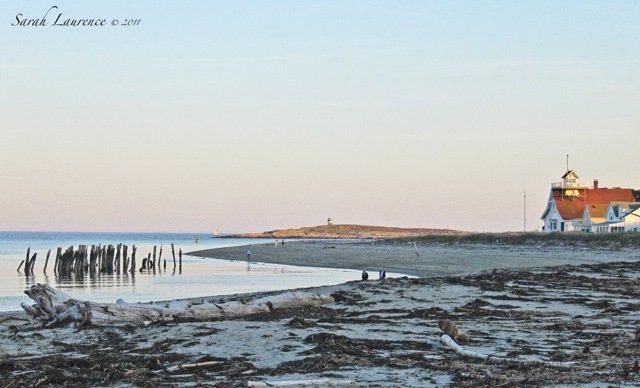 such stunning views - and the photo of scout on the beach, post-digging, is precious. 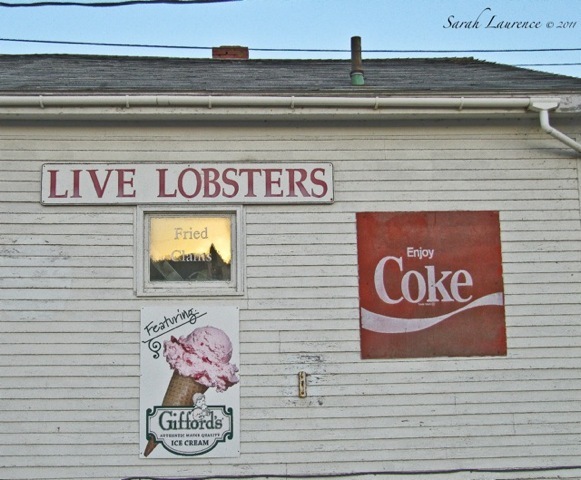 for some reason, i am now craving a lobster roll and bowl of moose tracks..
As always, when I visit, I experience the breathtaking nature of your gifted lens. You capture and share such amazing glimpses into life. Magnetic, stirring, altogether fine! Lovely sea photos! The blues are fantastic in your photos as well as in your paintings. Love the first photo and the last one with a white moon. And Scout!! I read your former post and knew that the book "You Are My Only" is beautifully written in prose many lines of which are like prose poetry. I appreciated the quotes from the book. Ever since I watched "～the Cuckoo's Nest" on DVD, I have always been interested in institutionalization. A combination of poetic prose and one of the heavy themes, institutionalization, must be very interesting! I wish I could send over some warmth from India to Maine, it would make you happier, and would make my life more enjoyable. What a beautiful end of the swimming season, Sarah :-). We have already had first frosts in the mornings leaving car windows and grass covered in white frost. So, this is your new puppy - Scout? I wish you to find a good companion in her. They have the same expression about the weather in Oklahoma! Lovely photos! Yet again, I wish I lived where you do. That first photo really gets me, with the rust-colored roof--I think it's the relationship of house to ocean that I like. Love the same color in the cover of Beth's book below. And yes, I do want to keep reading.